The latest trend in Mississippi real estate and farming is emerging as poultry farming. Searching for rural land for sale in Mississippi? Or perhaps for farmland for rent in Mississippi? Projections in farming indicate that the rate of growth over the next several years for poultry farming is skyrocketing and will more than double over the next four years. If you’re searching for the perfect poultry farm for you, look no further! 4 Corner Properties can meet all your needs in poultry farm real estate. You can browse for land for sale in Mississippi and you’ll find that the total value of poultry farms in Mississippi are currently at a market value of about $2 million. Get your farm prior to the boom and insure that you get the best price and the best farm option before the market is saturated! At 4 Corner Properties, you’ll find Mississippi farms for sale and find a farm, poultry operation, hobby farm or other farm property which is the perfect fit for your commercial or lifestyle needs. Mississippi has historically been known for cotton harvesting, soybeans, and corn, and now the poultry farm industry accounts for a large portion of the state’s main agricultural output. In fact, Mississippi is currently the number five United States producer in this area. In Mississippi, there are currently about 1,400 actively functioning poultry farms. With the emerging poultry market, productions netted 330,000 more than the annual estimate, mainly due to its increase in prices. Thus, now is the time to invest! The price of broiler hens increased seven cents per pound and the average price of a dozen eggs rose around forty cents. The total poultry production resulted in about 2.8 billion dollars, with around 2.5 billion of that coming from broiler chickens. The remainder of the production came from egg sales. Job production is another reason for the growing poultry industry. The poultry industry in Mississippi employs more than 25,000 people and generates another 47,000 or so jobs in supplier and related industries. This could be with those companies who supply goods and services to the poultry industry and enable the effective functioning of the process. Sanderson Farms in Laurel, Mississippi is one of the leading Mississippi poultry industry farms. Despite the rising costs in the market Sanderson has remained not only profitable but has even expanded their operation. If you purchase a poultry farm in Mississippi with a contract from Sanderson Farms, you are pretty much guaranteed to be given a twelve year loan by the lenders. This is true for almost all poultry farm land. Due to the growing production in this industry, it will be incredibly likely for you to get a loan with which to purchase poultry land. Investors have even been known to purchase the land and farm, and then find someone to manage it for them. There are many benefits to purchasing a poultry farm in Mississippi. Due to the rise in the poultry farming industry, several incentives have been created to encourage purchasing poultry farm land. Part of the reason for this, is that as farmers prosper in rural communities, you take the money you are making and invest it in local communities. This, in turn, helps the community as a whole, as well as the state economy. This cycle of economic growth and success is one which Mississippi wants to see continue. Thus, this results in many benefits for you, the buyer! Here at 4 Corner Properties, we’re committed to helping guide you through the purchasing process. We want you to understand the full scope of the advantages of buying Mississippi poultry farm land and how this commitment can work for your benefit. The most clear cut bonus for you is an almost guaranteed bank loan with the purchase of a poultry farm. Banks are eager to provide loans in this booming industry and when a poultry contract is provided for the land you are looking to purchase, you can be sure that you will get the loan you need. A program which may help you decide to purchase a poultry farm is the concept of Vertical Integration. In this type of production system, companies supply growers with the chicks, feed, and if necessary, technical assistance. The poultry farm owner, you, provide the chicken houses, equipment, and labor through a company. When birds are mature to the selling point, the companies transport the broilers to processing plants to be processed and marketed. Payment is on a cost-contract basis, or in other words, pay is based on the pounds of birds delivered. This greatly benefits you, the farmer, by providing some of the start-up, maintenance, and selling work, so that you are not in it alone. An extra incentive which many companies utilize is giving a bonus to the top achieving poultry farms. Another advantage is the use of tax cuts such as the fuel tax cut. The most common excise tax that a farm may utilize is the motor fuel excise tax, where certain uses of fuel, such as farm use, are nontaxable. You, the user, therefore, can seek a credit or refund of the excise tax paid for fuel. You may be able to claim the tax as a credit at the end of the year or gain quarterly refunds, depending on the fuel’s use. Such purposes include “farm uses” which consist of operations such as those on a poultry farm, as well as “farming purposes” which includes raising animals, as well as operating and maintaining the farm and its equipment. If you are selling another investment, consider the 1031 tax deferred exchanges. Using a simple and low cost 1031 IRS law can alleviate the tax hit you may incur and allow you to move your sale into another investment without that risk. 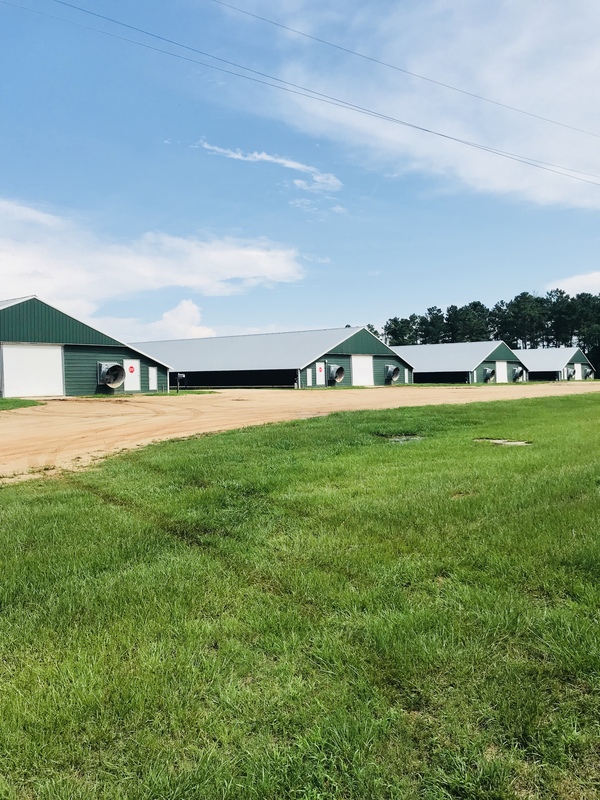 While you may be debating on whether or not you should pursue a future in the poultry farm industry, it’s clear that in Mississippi, the advantages of purchasing a poultry farm are many. 4 Corner Properties can help you find the perfect poultry farm land for your individual needs! With all the benefits of poultry farming, you will be guaranteed success!